Braden Howell tossed a 6-yard touchdown pass to Clay Cundiff with under a minute to go to lift No. 4 Bishop Carroll to a 42-41 victory over top-ranked Wichita Heights. With Carroll missing its top two running backs due to injury, Howell passed for 428 yards and four touchdowns to rally the Golden Eagles from down 20 points. Heights kept the pressure on with nearly 450 rushing yards on the night. The Falcons led 41-28 with a little more than five minutes remaining after a Dejaun Scott touchdown run. A Luke Linnebur touchdown run pulled Carroll within 41-35, and the Eagles later took the lead on Howell’s pass to Cundiff. Bishop Carroll improves to 5-2 with the win and has moved up to the No. 6 seed on the west side of Class 5A. Blue Valley Southwest pulled the upset of Week 7 by topping No. 2 St. Thomas Aquians, 30-27 to earn their first win of the season. The Timberwolves took advantage of several Aquinas turnovers to build an early lead. The Saints fumbled on their first three possessions and Southwest capitalized converting those turnovers into a 17-0 advantage. Aquinas pulled to within 17-14 at halftime on a Will Swanson touchdown and took its first lead 20-17 early in the third quarter on a Cameron Jackson touchdown run. The T-Wolves regained a 23-20 lead on a Billy Bartlett 75-yard touchdown reception. Aquinas grabbed the momentum back mid-way through the fourth quarter as Nick Bulleigh scored to make it 27-23. But the Saints fumbled again with 1:42 remaining giving Southwest another opportunity. The T-Wolves scored the go-ahead touchdown with 44 seconds remaining to win 30-27. The Timberwolves (1-6) were finally able to break through after being competitive for much of the season against a tough schedule. Southwest had lost four Eastern Kansas League games by seven points or less. In a game anticipated to produce massive offensive numbers and scoring, Hartford’s defense stole the headline by holding the state’s top-scoring offense to six second-half points in a 56-42 victory. The game was voted on by Kpreps fans as the statewide Game of the Week. The win puts the Jaguars in the driver’s seat for the Eight-Man, Division II, District 2 championship with two games left on the schedule. The first half went as expected as both teams moved the ball at will. Caldwell led 22-14 after the first quarter, but Hartford had pulled even at 36-36 by halftime. The Jaguars took a 44-36 lead into the fourth quarter, and Clayton Fowler provided some separation with a 35-yard touchdown run for a 50-36 lead. Caldwell mounted a drive that stalled at the Hartford 5-yard line. Shortly after, Fowler broke free for a 61-yard score to push the lead to 56-36. Fowler accounted for the Jags’ scoring in the second half, scoring three of his five touchdowns after the break. He rushed for 156 yards and four scores, had 150 receiving yards with a touchdown catch, and threw a touchdown pass to quarterback Danen Kistner. Dakota Volavka rushed for four touchdowns for Caldwell. Colten Ward rushed for more than 200 yards and a pair of scores in the first half for the Blue Jays. Garden City reclaimed the Hatchet by defeating Dodge City 36-13 on Friday night. The victory was sweet for the Buffs, which lost to the Red Demons 21-20 a season ago. Garden City led 13-0 lead before Dodge City’s Dawson Williams scored to pull the Red Demons within 13-7 late in the second quarter. But the Buffs quickly drove the field and quarterback Jesse Nunez scored from a yard out for a 20-7 halftime lead. Garden City expanded its lead to 26-7 after Nunez hit Zeke Herrera on a 50-yard touchdown pass. Herrera later added a field goal to stretch the lead to 29-10 in the fourth quarter. Peyton Hill added his third touchdown run of the game with just over a minute left to complete the scoring. Hill and Nunez each topped the 100-yard rushing mark in the game. Buhler scored on an Ethan White touchdown run in the fourth quarter to top No. 2 Andale 28-21. The Crusaders defeated the Indians for the second consecutive season. Buhler led by 14 twice in the game. The Crusaders scored the game’s first 14 points as White hit Jack Goertzen on a touchdown pass and Dalton Brown rushed for a score. Andale pulled within 14-7 after the first quarter, but Brown scored again to give Buhler a 21-7 lead. Tristen Dagenais tossed a touchdown pass to Parker Bruce to go in at halftime down 21-14. The Indians tied the game in the third quarter on a short Dagenais touchdown run. Brown led Buhler with 194 rushing yards and those two touchdowns. Andale quarterback Taylor Richter left the game early in the first quarter with an injury and did not return. Luke Haverkamp scored around the right side from a yard out with 58 seconds left to give the Thunder a 20-14 victory over Sabetha in a battle of unbeatens in the Big 7 Conference. Nemaha Central scored in the first quarter on a Ryan Hasenkamp touchdown run to grab a 7-0 lead. Sabetha pulled even at halftime after the first of two Blake Plattner touchdown runs. Plattner scored again in the third quarter to give the Bluejays a 14-7 lead. A Haverkamp touchdown catch in the fourth quarter tied the game for the Thunder. Trailing by a single point late in the game, Garden Plain faced a fourth-and-2 at the Conway Springs 12-yard line. The Owls elected to throw a pass into the end zone which fell incomplete turning the ball back over to the Cardinals to run out the clock on a 21-20 district victory. The two rivals played to a first-half, 14-14 tie before Conway Springs grabbed the lead early in the fourth quarter on a Riley Akiu touchdown run. Garden Plain answered immediately as Nate Pauly broke a 67-yard touchdown run to pull the Owls within 21-20. Garden Plain chose to go for the two-point conversion for the lead, but Pauly’s pass was incomplete. Pauly rushed for 164 yards and three scores for Garden Plain. Colton Terhune rushed for 94 yards and two scores for Conway Springs, while Trenton Jones led the Cardinals with 135 yards on 19 attempts. Noah Myers kicked a 35-yard field goal as time expired as Pratt won at Hugoton, 31-28. Hugoton rallied from a 28-7 second-quarter deficit to tie the game on a Valentino Degollado touchdown run and two-point conversion with 1:40 remaining. But Pratt drove the field aided by a penalty which set up Myers game-winning kick. Travis Theis and Hunter Kaufman each rushed for a pair of touchdowns in the first half as the Greenbacks grabbed a 28-14 halftime lead. Degollado ralled the Eagles with two short touchdown runs in the second half. Troy defeated Washington County 20-6 to win the Twin Valley League 11-man title and establish a measuring stick for the East side of Class 2-1A. Washington County got on the board in the first quarter for a 6-0 lead, but Troy answered right back. Reid Greaser hit Cuttar Huss on a 75-yard touchdown pass to tie the game at 6. The Trojans and Tigers remained tied until early in the third quarter when Huss caught another Greaser touchdown pass for a 13-6 lead. The Trojans took advantage of short field from a Washington County fumble on the second half kickoff to grab the lead. Greaser added a touchdown run later to widen the margin to 20-6. He passed for more than 200 yards and the two scores to Huss. Huss had 125 receiving yards and rushed for 75 to lead the Trojans. Goddard exploded for 42 first-half points in routing previously-unbeaten Valley Center, 49-7. The Lions’ Kody Gonzalez caught a 60-yard touchdown pass from Blake Sullivan, and added a 48-yard touchdown run as part of a 22-point first quarter. Sullivan also tossed a pair of touchdown passes to Bryant Mocaby and one to Owen Beason. Sullivan also broke free for a 79-yard touchdown run as part of his 115-yard rushing night. Gonzalez led the Lions with 153 yards on the ground. Sullivan passed for 165. Elijah Harris caught two passes for 101 yards and a touchdown and picked up a key interception as the Purple Dragons earned a 35-14 road win over the Bonner Springs Braves. After Bonner Springs cut Pittsburg’s lead to 20-14 with 1:30 left in the third quarter, the Dragons took over on offense at their own 43-yard line. Pittsburg quarterback Chase Curtis threw a short pass to Harris, and the speedy receiver broke free for a 57-yard touchdown. The ensuing two-point conversion pass from Curtis to Landon Conrad gave the Dragons a 28-14 lead with 1:13 left in the third quarter. Bonner Springs threatened to score in the fourth quarter with a first-and-goal from the 5. But Harris picked off Coleton Oakes’ pass in the end zone. The play capped a strong defensive effort from the Dragons that included two interceptions by Joel Kafka and a goal-line stand after Bonner Springs had a first-and-goal from the 3 in the third quarter. Overall, the Dragon defense limited Bonner Springs to 245 yards of offense. Curtis completed 8 of 13 passes for 204 yards and two touchdowns. Jhalani Long rushed for 92 yards and a touchdown and caught a touchdown pass. Fullback Noah Vaughn rushed for 84 yards and a touchdown. Oakes led Bonner Springs with 118 yards passing. Charlie Gray rushed for a pair of touchdowns. Despite being entering district play with a 2-4 record, the Hayden Wildcats were expected to challenge for the 4A-II, District 1 title. The Wildcats’ Centennial League schedule against 5A & 6A opponents always prepares them for district and playoff games. Hayden got a key district victory on Friday by topping previously-unbeaten and fourth-ranked Santa Fe Trail, 27-6. The Wildcats scored two touchdowns in the first quarter and held a 14-0 lead for much of the game. Tomas Stringer added his second touchdown run in the fourth quarter as Hayden increased its lead to 21-0. The Chargers would answer to pull within 21-6, but Stringer scored again to seal the victory. Hayden will travel to Holton (4-3) next week in a game that is expected to decide the District 1 title. De Soto took a major step towards a second consecutive playoff appearance with a hard-fought 14-13 win over Spring Hill. Things couldn’t have started any better for the Wildcats as Trevor Watts returned the opening kickoff 90 yards for a touchdown and a 7-0 lead. Spring Hill answered as Jacob Letellier hit Nathan Ewing on a long touchdown pass to tie the game at 7. The Broncos would take a 13-7 lead late in the first half as Letellier hit Mason Bell on a 40-yard touchdown pass. The PAT was missed. 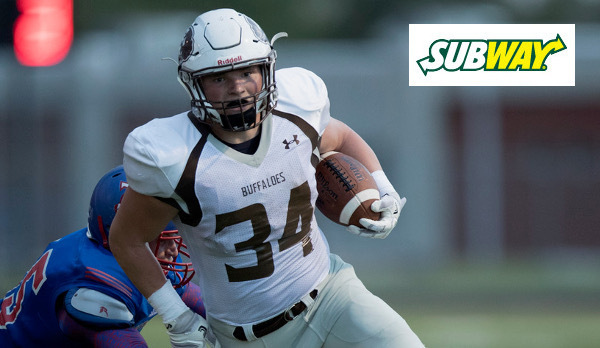 De Soto, which lost quarterback Bryce Mohl to an injury in the first quarter, took the lead when sophomore Brandon Taylor scored from four yards out in the fourth quarter. Daric Coffee intercepted Letellier with 2:45 remaining to allow the Wildcats to run out the clock.